Neutec Group introduces The SphereFlash® - an automated colony counter that grows and adapts to your specific micro lab needs. It can be upgraded at any time to fit the level of automation, security and features required. With numerous Flash & Grow colony counters units installed in a variety of Microbiology laboratories such as Environmental, Food, Pharma, Biotech etc., the IUL new SphereFlash® automatic colony counter utilizes cutting edge technology lighting conditions and intelligent software that make the day to day work easier then ever..
Modern led illumination, combined with a unique patent pending Sphere that operates as a perfact closed enviroment to best light conditions and images taking, smart but user friendly colony counting software (installed on Windows 7, 8.1 or 10 Based computers) together with a high resolution camera, makes for a powerful affordable automatic colony counter system. Detailed IQ/OQ validation protocols are available to ensure compliance with Good Laboratory Practice (GLP) and that results meet regulatory requirements. The SphereFlash® counts the majority of colonies on the various media. It’s high resolution color camera can detect and count colonies of aprox. 1/450 inch (0.07mm). The new patented illumination device enables processing of any media type including transparent/opaque agar without interference from ambient light source as the Shpere goes don and creates an insolated environment. The “SphereFlash®” automated colony counter modular approach enables laboratories to automate their colony counting processes, inhibition zone Measuring and upgrade them to a higher level of sophistication as necessary and within a budget. 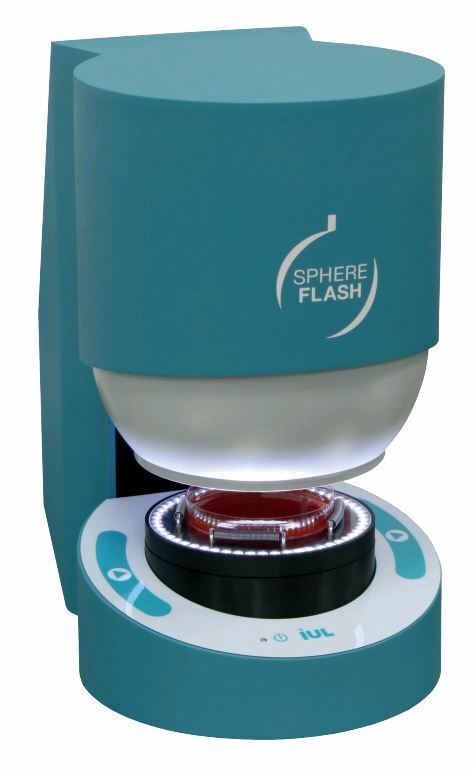 The new “SphereFlash®” automatic colony counter represents a real alternative to manual colony counting with its user friendly colony counting & inhibition zone Measuring software, repetitive and accurate results and affordably pricing. SphereFlash® Colonies Pro Software designed fro more demanding users who require increased capabilities such as, setting user's permission levels, LIMs connectivity, working with worksheets, Barcode reading, Reporting, audit trail and CFR21Part 11 compliance. For counting Pour and Spiral plates in 1 sec. We have implemented Neutec Group’s Eddy Jet 2 spiral plater and Sphere automated colony counter in our antimicrobial product testing and water testing applications. This has saved significant time compared to manual plating and counting processes. These instruments have also provided improved accuracy over manual methods. The Sphere Flash is a reliable, efficient machine that ends up saving a lot of time in the laboratory. I also appreciate the high degree of customization it has with regard to adjusting settings and interpreting plate readings. The Sphere Flash automated colony counter is a great time and money saving instrument. It is very easy to use and we are happy with the quality of the images and the full CFR21Part11 compliance. We are placing this counter in all 3 of our global locations which will allow us to share and compare results more efficiently.